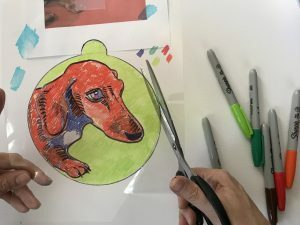 Dog Pop Art Shrink Paper Project Inspired by Your Dog or Any Pet. 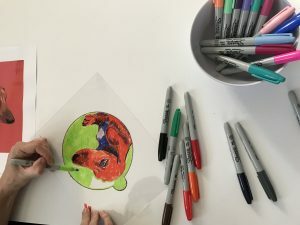 Julie and I love our varied and many pets and are always looking for fun ways to incorporate them in our art pursuits. 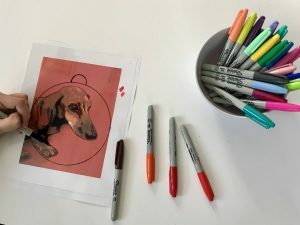 There are tons of ways to create pet portraits, but for this one we wanted an easy-peasy DIY pet art project that didn’t require an MFA from RISD. 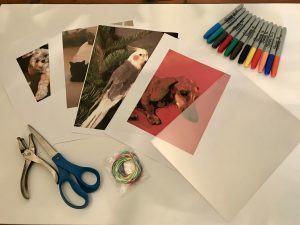 Adults need to have fun too, and one way to feel like a kid again is to use shrink paper! 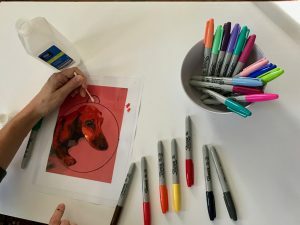 Use brightly colored sharpies and add a pattern, such as polka dots if you want to give it a Dog Pop Art touch. Pop artist Roy Lichtenstein incorporated giant Ben-day dots into his art. Ben-day dots were part of the four-color printing process in the 1950’s and 60’s. (As an art teacher, I love art history so I tend to digress). This project can be used as a sun catcher in a window, or on a perennial tree. I chose to do a portrait of our lovely, aging Dachshund Keira who’s about to turn 17 this March. 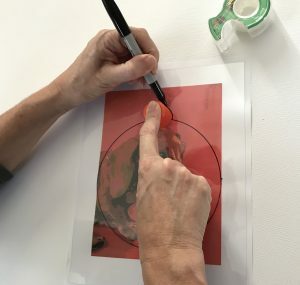 Place the clear shrink paper over your photo and tape down to keep in place. 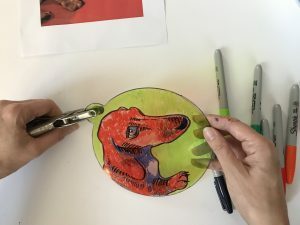 Using a stencil or object (bowl, lid, etc. 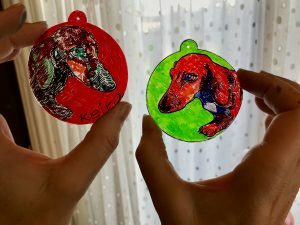 ), draw the shape of your ornament on the shrink paper. Use a smaller circle, such as a bottle lid, to add a half circle on the top that you will punch a hole through. 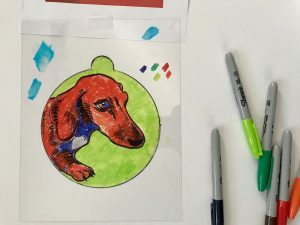 Outline your pet with a dark color. 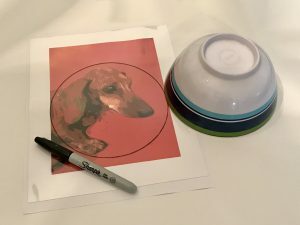 Tip: Before coloring the background in, I “erased” the line between my two circles with rubbing alcohol. Rubbing alcohol will take away the sharpie. Use a Q-tip or cotton ball to apply. You can color the background area with one color, use a pattern or add extra details. 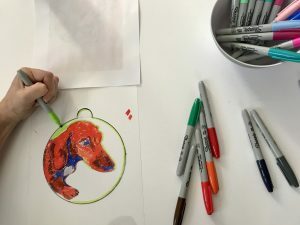 Color your pet as simply as possible capturing the details and markings that make him/her special. 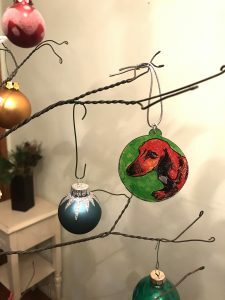 Cut your colored ornament out of the shrink paper and hole punch the top piece. 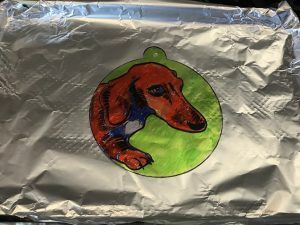 Place it color side up on the cookie sheet. Place in PREHEATED oven for 1 to 3 minutes. 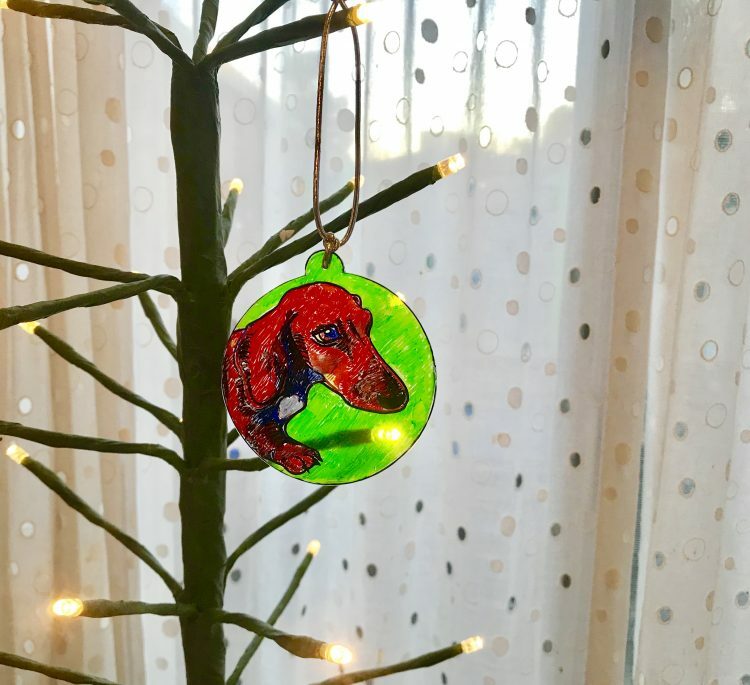 Watch your ornament shrink and make sure it lies flat for 30 seconds in the oven to finish. If it does not come out completely flat you can lightly press a folded piece of paper for about 15 seconds until it is completely cool. Step 5: Add Ribbon And Hang! Failed attempt on the left! BTW, I don’t always get it right the first time! In my first version on the left, I didn’t color the shapes in solid enough. Also I didn’t use a variety of colors, so the whole thing was way too dark. Chinese New Year Decorations that are easy and edible!